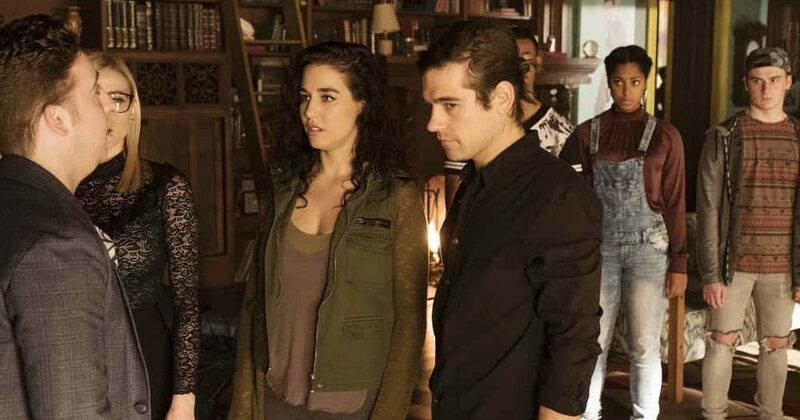 On The Magicians this week, the fifth key was revealed as Quentin, Alice, and Kady find themselves transported to another dimension and forced to party. Seems easy right? Not so much. Picking up from the last episode, Quentin and Kady return to the Physical Kids’ cabin without Harriet and Victoria, who we last saw trapped in the mirror bridge. Kady laments that the two women likely didn’t survive because both mirrors shattered. They run into Alice again, who was probably dropped off on earth by the other Librarian traveler. As Kady says she needs to use the truth key to see if Penny made it back, the magical book begins to act up by shaking and fidgeting. Q takes it out of his bag (which had been locked in a drawer for safety) and it opens to reveal a set of pages with symbols printed on it. He thinks it’s some kind of code with Alice saying that it looks familiar. She wants to take a closer look, but he refuses until she finally tells him what she was doing at the Library. She reluctantly reveals that she needed information to complete her work on a grand unified theory of magic. Except Quentin points out that there is no magic right now to unify. The ex-niffin then states that those symbols are medieval musical notes and he hands over the book. 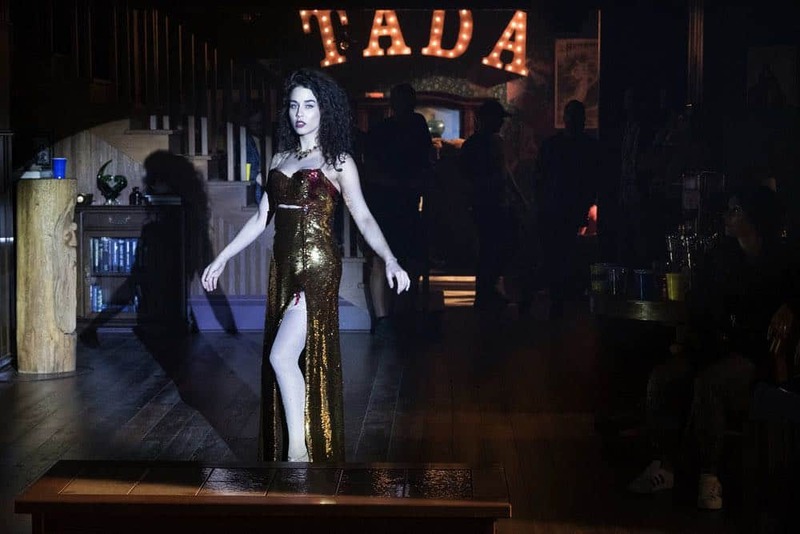 Alice sits in front of the piano and plays the keys with Kady pointing out that back then scales started with an A not a C. As the other woman sits down in Ms. Quinn’s place and performs the other scale, their environment suddenly changes with the piano disappearing and a crowd of people appearing. The three magicians are thoroughly confused and have no idea what’s going on. They don’t know who everyone is until they spot Todd. Even stranger is that Josh makes an entrance descending from the stairs as the star of a musical number. At the end of the performance, they ask him where they are and what is going on. As soon as a serious tone is used, the crowd stops partying and in unison stare at the group like mind-controlled zombies. Todd comes over and explains that the only rule around here is to be cool (or else you leave and in not a pleasant way) and that magic is back baby! Except it’s only magical party tricks like lighting up joints. Alice’s locator spells aren’t working and Kady tries some battle magic to no avail either. Q says they are here because of the quest and so there must be stuff that they can and cannot do. Kady though loses her patience and angrily tells Alice that for all they know this could be her doing as an agent of the Library. Her frustration causes her to throw the glass of scotch against the fireplace and all the party people stop and go into zombie mode again. They restrain Q and Kady and look like they are about to attack when Alice suddenly starts to sing happy birthday. The other two magicians join in as the song seems to calm the horde down and they begin to start smiling again. The three spot Josh and Alice says that they need to figure this out now. She says that she can get him alone but that someone needs to stay downstairs as a distraction so that the others don’t get any bad vibes. Kady volunteers and we learn that Jade Tailor has an amazing voice! She magically puts on a sparkly gold dress and engages in an impromptu show. As she begins to sing, Todd interrupts her and says that she needs to sing based on the E scale because they like E. Gritting her teeth, she thanks him and continues with the performance as Alice takes Josh upstairs for some alone time. Once she gets him into his room, Q appears from behind the door and they tie him down to a chair. It seems that the piano had been moved up to this room and Josh explains that it’s there so he can practice. Alice points out that this isn’t even his room with Quentin adding that he’s a naturalist and this isn’t his cabin. Annoyed, the elder magician tells the other two that’s about all they know about him. He asks them where’s he’s from, where did he go to undergrad and when was the last time they actually saw each other. It’s now very clear that Josh has been forgotten by the rest of the squad. He had called and texted them over and over and the only person to respond was Julia. Kady casts a spell downstairs to keep their audience entertained while she heads upstairs to join Q, Alice, and Josh. When Quentin tells the tied-up magician that he ditched them in Fillory, the other man claims that it wasn’t the same because it was cowardice not indifference. Josh adds that its fine because they don’t really know each other and now they don’t have too since magic is back. Q challenges him to get himself out of the ropes then, but of course he can’t. Alice jumps in by saying that she’s worried the longer he stays here the less likely he’ll want to leave because it feels good. Kady however is fine with the elder grad student remaining put as long as he tells them how he got there so that they can get out. Josh recalls how when he couldn’t get in touch with Kady he called everyone else and when no one responded he went back to Bacchus’s where the party was still raging. However, no amount of pharmaceuticals helped him get over the fact that he had been ditched by the other questers. This wasn’t a new experience for him and seemed to be the theme of his life. He recounts how he was supposed to go to a David Bowie concert with his brother (one that Kady also attended), except that his own flesh and blood decided to take a girl instead. Alice steers the conversation back on course and Josh explains how he ran into Todd at the party. Todd then tells him that magic is back and when he asks how, the other magician opened a door that lead to the Physical Kids’ cabin. He then shows Josh the fifth key and while he tries to ask how he has the magical object the party mob went into angry mode. As Alice, Q, and Kady try to convince him that this isn’t the real Brakebills, downstairs Todd’s discovered that they have been duped by a trick. Mr. Hoberman is still resistant and says that if this is his own private Idaho then he wants them out of there. With the mob banging on the door, Josh opens it and resumes the party with a conga line. Alice tells the other two that she thinks Todd is actually a demon from German folklore that creates a pocket universe where all your fantasies come true while it feeds on your happiness. As they try to figure out why the quest brought them there, Q concludes that the key still has got to be there. Both Alice and Kady realize that demon Todd has a fetish for the E key and they rush to the piano where they find the object lodged inside the musical instrument. As the three of them stare at it waiting for something to happen, Kady loses her patience and grabs the item. Suddenly another door appears with the sign, “Questers Exit Here!” in neon pink. To make matters stranger, they all start to hear Penny’s voice. The traveler is still at the Underworld branch of the Library where he is currently shelving books. 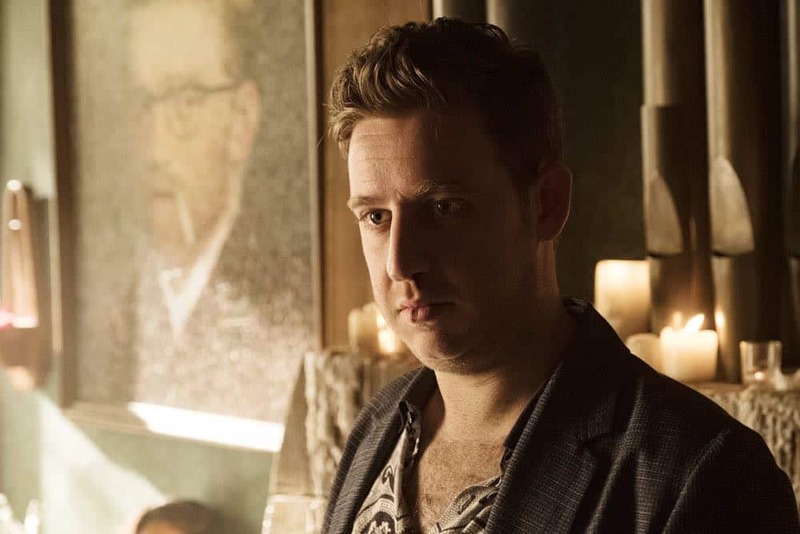 It soon becomes apparent that the whole team has been mentally connected somehow: Penny in the Underworld, Eliot and Margo on the Muntjac in Fillory, Julia at Brakebills, and Q, Alice, Kady, and Josh in the pocket universe. Looks like this is through the power of the fifth key. Kady and Alice want to go through the door but Quentin realizes that they were brought here and all eight of them were linked together because the key needs them to work together. Josh however has had it and tells them to leave. Demon Todd and his mob begin to beat him up in the living room and Q tells everyone else that they must save Josh (the quester who is always forgotten) and convince him to come back to the real world. He knows that they are seriously screwed as always, but if they don’t unite now the quest will be over. Q casts a spell so that all of them will know the words to Under Pressure and declares that they all have to sing. The following scene is so incredibly powerful and moving. If you didn’t feel anything then you are dead inside. Each individual takes a turn singing (even a super reluctant Penny) and the angry mob stops beating Josh up. We switch to different places showing that Julia’s god powers level up (saving Sky the fairy after she successfully used her magic for the first time but a cursed necklace began killing her), the Muntjac falling off the waterfall and then flying, and Penny in the Underworld library stacks. As Josh joins in the singing the group is finally unified as one. Once the song ends, we see the true face of the demon who tells them that they said you’d ace it. Now who is they?? The other gods? The demon continues confessing there was only one that he’d do this for and that truthfully after a couple of weeks he was losing faith that Josh’s friends would even come or that they’d actually be worthy. The key stops working however and they can no longer hear each other. Their demonic host then ushers them out because pigging out on Josh’s emotions have left him gassy and he needs to go to an ashram. 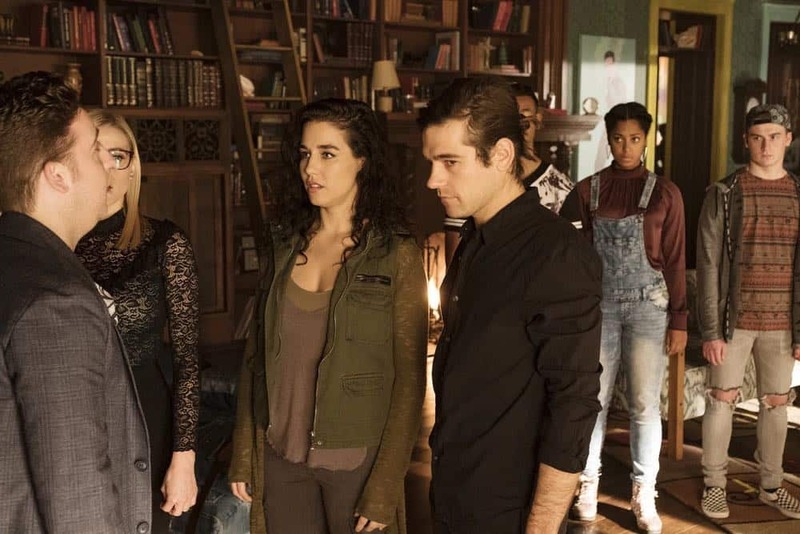 The magicians then return to the real Physical Kids’ cabin shortly followed by Julia (with the truth key). The magical book then reveals the next chapter (they are now in chapter six FYI). Alice grabs the tome from the piano with Q looking dubiously at her. She asks him, “really?” and then hands over the item. 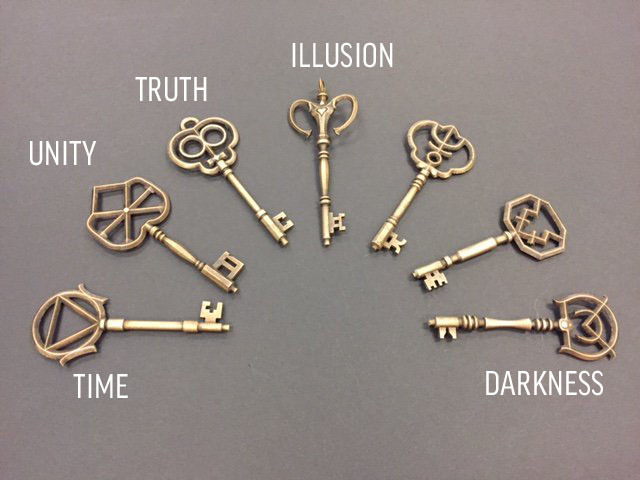 So the fifth key is one that unites a group together but under what circumstances? Stress? Imminent danger? Five ones down, two left! The Magicians airs on Syfy Wednesdays at 9 pm.